To truly understand your strengths and weaknesses, you need more than just a sense of where you’re at in relation to the competition. Find out why market research is an essential ingredient in any successful brand strategy. No brand exists in a vacuum. Appraising your competitor’s activities and comparing them to your own is crucial to your success. But how to do it? You can monitor their presence and reputation on social media, look at their website and marketing campaigns, and then put your energy into outdoing or keeping up with them. But this type of competitor awareness can only take you so far. To get an accurate picture of how you measure up, you need to select metrics and gather meaningful, like-for-like data that indicates strengths and weaknesses for both yourself and your competition. So rather than acting on a hunch or letting competitors lead you, you can assess the optimum strategy on the basis of consumer insights. Obviously, competitors won’t be rushing to share their data with you. But metrics like NPS, social ranking and more can be gathered quickly and easily from a panel of consumers, providing a collated score across multiple variables. Crucially, you’ll need to measure your own business according to the same metrics you use to track competitors, so you get a benchmarked measure of your performance. What Are Customers Really Thinking? With your data gathered, you can start to analyze it to really get a sense of how your competitors are received, what are their strengths and weaknesses and where there are opportunities for your own organization. It allows you to monitor brand perceptions over time, and even zoom in on particular aspects of the brand experience in relation to your competitors. Is your customer service strong but shipping cost high compared to the market baseline? Can you capitalize on a gap in a competitor’s offering to really own a product niche? Being able to visualize all of this and drill down into the data to really test your assumptions is where a market research platform comes into its own. With the flexibility to cut the data how you want, change your question set and really hone in on the areas that matter to you allow you to become ultra-targeted in how you analyze and respond to competition. However sophisticated your method, competitive analysis performed once is just a snapshot of your market position. With your competitor analysis set up, you should keep measuring on a regular basis to see performance over time. Once you’re running a regular measurement, you can start to interrogate your own strategy and see what’s working as well as where there’s room to improve. 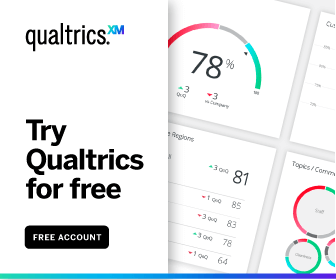 With Qualtrics, you get complete flexibility to set your questions, choose your panel and apply powerful statistical tools to surface actionable insights about your competitors. With a simple drag-and-drop interface, anyone can get started in minutes and share real-time with the right people through simple, easy to understand dashboards. It means your teams have all the insights at their fingertips to help you grow your brand.